KTMtwins.com KTM Motorcycle and Product News: New items coming from KTM! Looks like KTM is gearing up for a new catalog of Hard Parts and so are we.The EVO Kits fit the KTM 690 Enduro/690 SMC. It comes in two different configurations: One is the EVO Complete Kit. 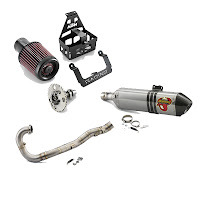 The other is just the EVO 2 Kit, which consists of a cam from their race proven 690 Rally Replica, a Pod Filter Conversion Kit, and a relocating battery box. This kit is guaranteed to increase those ponies. We have them in stock!